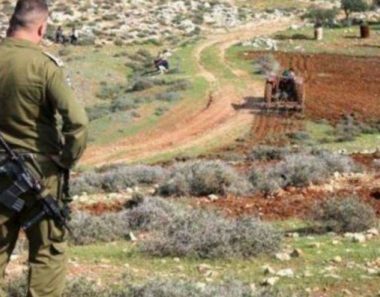 The Palestinian Ministry Of Foreign Affairs issued a statement, Wednesday, strongly condemning an illegal Israeli decision to confiscate 522 Dunams (128.9 Acres) of Palestinian lands, for its colonialist activities, in the southern part of the West Bank. The Ministry described the Israeli decision as “racist,” and added that Israel’s so-called legal system is part of the same illegal occupation of Palestine, and therefore, Israel’s High Court, which authorizes the annexations, is an integral part of this regime, and acts to protect it. It called on the International Criminal Court to initiate a serious investigation into Israel’s ongoing and escalating illegal colonialist activities, and their devastating effects on the locals, especially the farmers who are losing their livelihood along with their lands. The Israeli decision aims at constructing hundreds of units in the Gush Etzion colonialist bloc, south of Bethlehem, with the intention to boost the colonialist activities and link the blocs with other colonies, in the southern areas near Jerusalem.